In the 70's it became a Christmas tradition. Of riding a emotional rollercoaster. That took you to the highest highs and definitely the lowest lows. And every Christmas season it got stronger. The presents were the same but more expensive. I am talking about being a Ramfan from 1973 thru 79. In 1973, it was 2 days before Christmas when the Rams met the Dallas Cowboys in the first round of the playoffs. If we played by today's playoff rules the 12-2 Rams would of been host to the 10-4 Cowboys. The Rams first two offensive plays were turnovers and before 6 minutes is played it is 17-0 Dallas. And that is just the half of it. FG kicker David Ray missed three chip shot FG's (9 points). The Ram defense played great and forced two turnovers as the Rams narrowed the lead 17-16. On a 3rd and 10 Staubach hit Drew Pearson for a 75 yard TD to put the game out of reach. It would be my first ram rollercoaster ride. One night later on Christmas eve I opened my presents and got a Ram belt, Ram T-shirt and Ram cards. As Christmas season rolled around, our Rams were in the playoffs for the second straight year. On Dec.22 the Rams were hosts to the Washington Redskins in the first round of the playoffs. Over 80,000 Ramfans were at the Coliseum to witness a hard hitting defensive struggle. I can still hear that roar when Isiah Robertson picked off a Sonny Jurgenson pass and runs it some 60 yards for the game winning TD. Two days later it is Christmas eve, my presents were a Ram jacket and Ram cap. The Rams should of played the NFC Championship game against the Vikings in 70% Los Angeles instead of -12% wind chill factor Minnesota. Both teams were 10-4, and the Rams had won their one regular-season meeting. Until 1975, however, the NFL rotated playoff sites, and it was the NFC Central's turn to play host to the conference championship game. Forget about it being the NFC Championship game, name me any game that a team goes over 99 yards and gets no points and loses by 4 points. OVER 99 YARDS!!! That doesn't happen in Pop Warner. In the 3rd quarter, the Vikings hold a 7-3 lead. A punt pinned the Rams inside their 1-yard line, but we moved out of danger to their 25. Then Harris hit Harold Jackson for a 73-yard gain. Jackson should have scored, but he was nudged out of bounds by Jeff Wright at the Vikings' 2. One play later the Rams were less than six inches from a 10-7 lead. But Harris, who could have fallen forward for the go-ahead TD, switched to a long count.The refs said Hall of Fame guard Tom Mack flinched, costing the Rams five yards. Two plays later, linebacker Wally Hilgenberg intercepted Harris' tipped pass in the end zone. The Rams had gone 99 yards and produced no points. We lose by 4 points. It's been over 30 years and the pain is still fresh. Now I circled the wagon with this team. 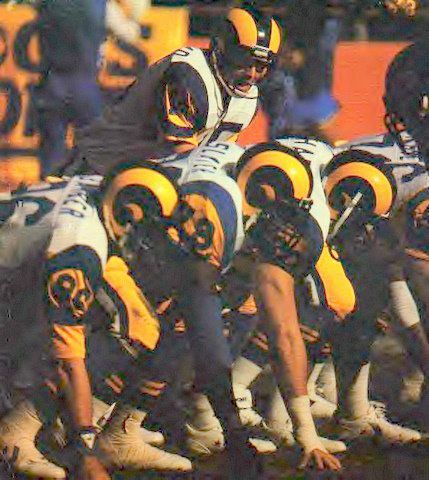 The Rams go 12-2 in 1975 and secure homefield advantage thruout the playoffs. On Christmas eve one of my presents was a Ram authentic Jersey from 1955. Two days later the Rams start their playoff run. The 12-2 Rams and 11-3 St. Louis Cardinals met in the first round of the 1975 playoffs. The Rams defense was number one in the NFL in 1975, allowing just 135 points for the season. The Cardinals under Don Coryell, had the number two offense in the league. Also, their offensive line only allowed 8 sacks for the entire season. Coach Chuck Knox didn't decide who would be QB until game day. To the surprise of many, he went with Ron Jaworski instead of James Harris. On the first series of the game, the Rams went 79 yards (51 yards by Lawrence Mccutcheon) that was capped off by a bootleg by Jaworski that gave the Rams a 7-0 lead. On the Cardinals second offensive play, Jim Hart's pass was intercepted by Jack Youngblood who ran it back for a 47 yard TD making it 14-0 Rams. That roar is in my top 5 loudest at being at the game. On the first play of the second quarter, Bill Simpson intercepted his first of two taking it all the way back for a TD making the score 21-0 Rams. The Cardinals finally got on the board as Jim Otis took it in from the 3 yard line,but, Jack Youngblood blocked the extra point making it 21-6 Rams. But the Rams didn't waste any time getting back that TD as Jaworski connected with Harold Jackson on a 50 yard TD strike. At the half, the Rams had a 28-6 lead. The second half saw the Rams run the ball as Mccutcheon rushed for then a NFL playoff record of 202 yards on 37 carries. The final score was 35-23 Rams. Jack Youngblood was named player of the game as he recorded one sack, one forced fumble,one blocked extra-point attempt and returned an interception 47 yards for a touchdown. We matched up so well with the Vikings, but, because of Staubach's "Hail Mary", The Cowboys are coming to LA. NFC CHAMPIONSHIP GAME There was almost 90,000 of us at the Coliseum, and we were LOUD. From 1966, I have gone to 85% of the regular season home games and never missed a playoff home game. You know, when your at a game you see who is dictating to whom. The only game where our Ram defense was beaten was this game with Dallas. They were so hot they would of made God punt. We gave our Rams a standing ovation as they came out of the tunnel for the second half. Carroll Rosenbloom thanked his fans with a two page "thank you" from the LA Times. Now it became a obsession for the Rams to get to the Super Bowl. Six days before Christmas the Rams played the Cowboys in the first round of the playoffs. One of the greatest emotional rollercoaster rides ever. Here is just the last two minutes of the game. The Rams have a 14-10 lead with just two minutes to play. Charlie Waters has blocked one punt of Rusty Jackson. It is 4th and 2 on our 41 yard line, hoping to pin Dallas back deep, disaster happens. Waters blocks his second punt. the ball rolls all the way to our 17 yard line. The Dallas crowd is going crazy. and look who is their QB. Captain comeback Roger Staubach. On first down, Roger hits Butch Johnson back in the endzone. it looks like a TD, but, Johnson has a half a foot out. The next two passes are incomplete. It's 4th and 10, Staubach hits Billie Joe Dupree exactly on the 7 yard line, he goes to turn around and is met by Elmendorf and Simpson and all three drop right there. Both teams surround the chain. you can't even se the refs. but all of a sudden you see Ram helmets jumping up and down. Dallas missed a first down by inches. You think it's over, but, Dallas has their time outs. It's fourth down and the Rams are punting from our endzone. Waters already has blocked two, the crowd is crazy. Every Ramfan in the world was not sitting down, they were standing up. about a foot from the TV. Rusty Jackson takes the snap, fakes a punt then darts right sprinting. Every Ramfan eyes slowly widen and so does their mouth, for about 2 seconds. then they realize that our punter took a safety making it 14-12. Time has expired and the Rams win. CBS shows Carroll Rosenbloom, his son Steve and Don Klosterman in their suite at the game. All three did the same thing, not sitting down, eyes got big then realized what a strategy. And that was just two minutes of the game. My Father and I did not sit down even at halftime. We were just about a foot from the tv. For Christmas I got Blaupunkt am/fm cassette for my 1972 Ford Ranchero that I had painted Ram blue and pin-striped yellow. 1976, the Vikings and Rams met again in the NFC championship game. The coaching staff gave the Ram players their book on the Vikings. On page one Coach Knox wrote "Be aggressive" Attack! To the Ram offensive line was the coaching staff concern of the Viking 5 man line,which gives the Vikings a man to man pass rush with Page stunting. The coaching staff said "lock them up and give our QB time and you won't see it anymore. The Ram put a new wrinkle in their goal line offense with a flanker reverse with Jessie. In the last practice before the game a fight broke out between Hacksaw Reynolds and Terry Nelson. The Ram coaches let them go at it for some time and when they broke it up, all the Ram players cheered. Emotionally the Rams are ready. Here is the first quarter stats. Rams run 22 plays to the Vikings 5 plays. Rams 7 first downs to the Vikings 1 first down. Rams outgained the Vikings 89 yards to their 17. But the Vikings are winning 7-0. The Rams Ground Chuck offense was blowing holes in the Minnesota defense. On second and goal from the Viking 4 yard line, the Rams do a flanker reverse with Jessie, he scores, but the refs say no and move it to the six inch line (just look at the pics he scored the refs AGAIN blew it). Knox decides to go for three. Dempsey goes out for the chip shot FG. But Nate Allen blocked the kick, which bounced directly to defensive back Bobby Bryant, who dashed 99 yards for the game's first points. That is a 14 point turnaround. Rusty Jackson gets his punt blocked. The Vikings take a 17-0 lead but our defense brings us back, the Rams score 2 TD's, but Dempsey misses the extra point making it 17-13 Vikings. The Rams have the ball inside the Viking 40 with less than 3 minutes to play. But we need a TD and the Vikings play prevent. Knox decides to go for it on fourth down. It is 4th and 10 on the Viking 39 yard line. Knox tells Haden the Vikings will be playing for the short pass thinking the Rams just want a first down. Knox said " You should find Jessie or Jackson clear on the play called "sixty-five". Haden faded back to pass reading the Viking's free safety Paul Krause. Krause went to the weak side after Jackson. Jessie blew right by Nate Wright. Haden didn't have time to look at Jackson before hitting Jessie. And their right corner back Bobby Bryant sprinted all the way across the field. Jessie didn't even see him coming. As the ball was going to fall in Jessie's hands for the game winning TD. Bryant, at the last instance, took the ball from Jessie and the Rams. 1977 CHRISTMAS SEASON Christmas of 77 was great. I got a Sony Betamax video recorder and had my step Mom record the playoff game one day later. The reason in just one day we are getting our revenge from the Vikings. Instead of playing in Minnesota, the Vikings have to come to us. And the playoff game was finally in the L.A. Coliseum. It would have been better for us if we played the game in Minnesota. It rained for three straight days and nights before the game, turning the Coliseum turf into goo. The "Mud Bowl" was made for the plodding Vikings. Chuck Foreman ran for 101 yards and a touchdown. Lee completed only five passes, but he did not turn the ball over. Haden, meanwhile, threw three interceptions (to this day, I am convinced Joe Namath would of gotten us a win), including one in the end zone. Rafael Septien missed a short field goal, and the Rams once again were on the short end of the score, 14-7. Three playoff games that we dominated in stats but not where it counts. For the 1978 season my gifts were a game worn Ram jersey and mug. 1978 FIRST ROUND GAME On New Years eve of 1978 the Rams first round playoff opponent is again the Vikings. Was I nervous at halftime when it was 10-10. Your damn right. And I wasn't alone in that feeling. It seemed every Ramfan in the Coliseum felt that way too. But, finally we bury that demon. The Rams scored 24 unanswered points in the second half. Letting Tarkenton go out a loser.Rams 34-10 winners. 1978 NFC CHAMPIONSHIP GAME Again the Rams and Cowboys played for the rights to play in the SB. That day the Coliseum was rockin. It was another defensive struggle. At halftime, the game is still scoreless. In the middle of the 3rd quarter, Haden was intercepted by Waters as he returned it to the Rams 8 yard line. The defense holds,but, a defensive holding was called on Perry giving the Cowboys a first down on the Ram four line. 3 plays later, Dallas scores. We go on our best drive to the Dallas 23 yard line. 4th and less than a yard, we go for it. Bryant was stopped for no gain and that was the beginning of the end. The Rams first playoff game isn't for a week. My Xmas presents were a custom gold Ram ring. Greatest 30 days being Ramfan. It started on December 30, 1979. The Rams played the Cowboys in the playoffs. My Father, my stepmom, my brother and his wife, my best friend and his wife, and my wife (then girl friend) were at my home watching the game. CBS wanted a Dallas-Steeler rematch, the experts gave us no chance. Dallas beat us in a regular season game 30-6. And for the first time we were a nine point underdog (largest ever). But our Rams had a 14-5 halftime lead, we were going nuts. Then late in the fourth quarter dallas took a 19-14 lead and it looked like another snakebitten playoff loss by our Rams. Then when Vinnie hit Waddy for that 50 yard TD, this is exactly what happened in my living room. I slide on my knees like I am on ice to one inch from the TV screen. My ears and eyes are focused on one thing, A FLAG!! I see none, our Ram players don't act like there is one and they say their isn't one. I turn around and this is what I see. The 7 of them our hugging each other and jumping up and down like it is one person with 14 legs. I run to join them, but my momentum as I hug knocks us off balance and all 8 of us, hugging as one, crash into my coffee table breaking it in pieces with crap going everywhere. But we don't even give it a thought. ALL 8 keep hugging each other and screaming with joy. What is etched forever in my mind is the faces of my Father and Brother virtually and inch from my face yelling and smiling. On January 6th, 1980 our Rams finally win a NFC Championship game and our headed to the Super Bowl. I was selling stereos (big business back then) in Fresno, Ca. I talked my General Manager of the 11 stores (it was kind of easy since he is a big Ramfan) into doubling our advertising budget. We ran ads on radio and TV if you come in our store wearing anything Rams, you got Koss headphones at 5 bucks. Over 200 ram fans showed up to see us burn this dummy wearing a franco jersey. (so did the fire dept and fined us 150 bucks). The whole store was RAMS!!! I drove down at 1 am and met my Father and went to the game. Father were on a bus with Steeler Fans from the Pittsburgh area. They were giving it to us in a classy way. Never has there been a more picture perfect day. When Summerall announced to the world "THE STARTING DEFENSE OF THE LOS ANGELES RAMS" I got a little emotional. For the reason these great players who have came so close virtually every year in the 70's are getting their due. It was a great game and when the bus took us back to where we all parked, most of the Steeler fans and me hugged each other. I get back to Fresno and sleep until Tuesday. Just 2 days removed from SB 14. I am talking to some customers and I see this guy walking slowly past our window and we make eye contac and he gives me a "what's up" nod. I say to the other salesmen "I thnk Rod Perry just walk by". I go out and say "Hey Rod, what do you think of our store?" (hoping he doesn't say "my name ain't Rod") he says "it looks great". Then I say "Get in here and meet your greatest fans". He stayed in our store for almost 2 hours and answered every question 3 die-hard Ram fans could think. (most were goofy,but,some were not bad). What the offensive line of the Rams were saying to the steel curtain. We ask about Ram players, other team players and coaches. It was awesome, then I said "Rod, only if you were an inch taller" on that Stallworth TD. He says do you have a sheet of paper and a pen. I grab some blank typing paper and he diagrams how the Ram D blew the defense on that TD. He uses two sheets (messed up on the first) after he is finished I ask would he sign them, he does. He said Cullen Bryant was coming to stay with his family next week for a few days and the both of them would stop by. Jan. 29th, 1980 Just like he said, they both came in (let me tell you Cullen Bryant biceps are bigger than your thigh.They both gave us jerseys and signed pics. These two are class not just in football but as men. It was an era that Rod was flattered that we were running Ram ads on the radio, that's why he walked by our store and gave us game worn jerseys. if that game was last year, Rod Perry wouldn't have time to be walking in front of a stereo store just two days after the Super Bowl, Stallworth and Rod would be booked on every show for months. I have a 1977 game worn Ram jersey from Joe Namath (there is only 17 others in the world). Also,I have a unused Super Bowl 14 ticket (not many of those floating around). But, I have something that is one of a kind, Rod Perry diagrams of the 73 yard TD by Stallworth and 2 hours talking to one of my favorite Rams ever, THAT'S PRICELESS. Since my Father and Brother are no longer with us, that memory of their two faces just an inch from my face and going to the Super Bowl with my Father and giving my Dad the Cullen Bryant Jersey makes it the best 30 days as a Ramfan.